That is the number of pounds that have joined PetRescue in 2017. Half-way through the year, and with pound reform being the single most important movement in animal welfare, and not a single pound has signed up to advertise their adoptable pets to homes who would adopt them. The program was designed to build awareness in the community of the reluctance of councils to bring direct-from-pound adoptions to their facilities - to replace killing - when managing unclaimed pets. Currently only 1% of all council pounds are utilising PetRescue's free services to advertise their pets for adoption. This a sad state of affairs, considering 80% of pound cats and 40% of pound dogs are killed every year because homes aren't found for them. With your help, we can change that! We believe every pound pet deserves a public face - whether they are lost and needing to be reunited with their owner, or waiting for a new family. ***BREAKING NEWS*** Every dollar we raise over $50,000 will be invested in the creation of a new website to reunite lost pets and owners! .... PetLost.com.au - a new centralised website both the public and pounds can use for listing and searching for lost pets. The Safe and Sound pounds program community outreach elements were shelved. The program is now just three pages in the PetRescue library. And rather than show the community how to advocate for real, positive change for pets at a local level, they've instead sent staff to 'meet and greets' and photo ops at the AIAM - Australian Institute of Animal Management Inc. conference and the South Australian Local Government Authorised Persons' Association (APA). Zero councils have come on board in 2017. In fact, the last time a new council facility was recruited by the organisation was way back on in November 2016. While just 12 councils (of about 540 councils in Australia) are active on the site. It turns out pandering to councils is a failed strategy. This is why Getting 2 Zero is a decade old and has yet to produce a single community where homeless pets are truly safe. Rather than bring about improved outcomes for pets, pandering to pounds who are still using killing as their primary method of population control, gives them the cover they need to continue to delay implementing the programs that save lives "... we talked about it. It is being considered. 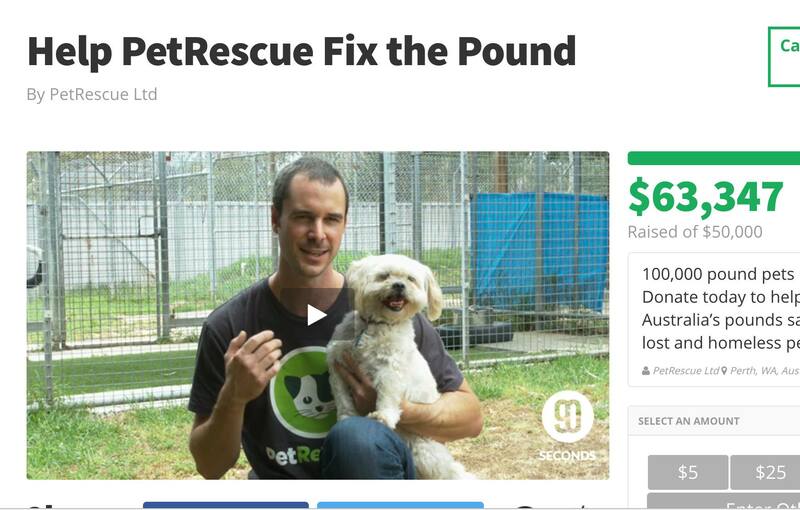 We're all working together"
And yet, pandering to pounds is the strategy being used with an extraordinary lack of success for PetRescue's now toothless "#SafeandSoundPounds program. Can't we all just "work together"
It is not a lack of “working together” which kills pets. There has been untold millions of hours of “working together”; communities doing all they can to save lives. “Working together” when pounds call rescue groups week after week to collect the pets they would otherwise kill. “Working together” when pounds call rescue groups on a Friday afternoon - or the day before a public holiday - because they don’t want to clean kennels - demanding they collect the pet within a two or three hour window. Pounds who fail to give beds or bedding, or vet care, or extra care to young or old pets - “working together” as the community bring in whatever resources the pound refuse to provide. There’s so much “working together” going on right now - the community breaking their own backs to do the work of local councils - for free, I'd speculate the community is at their absolute “working together” limits. They literally cannot do more. The idea that the reasons pounds kill is a lack of “working together” is frankly offensive to every single one of the thousands of rescuers who are saving lives FROM the pound. “Working together” does’t make pounds safer. Pounds without adoption programs are just as dangerous as they’ve always been - it’s just now some of the time rescue groups are able to beg to be allowed in the door and save as many as they can. If councils were really interested in "working together", they'd be falling over themselves to start advertising their pets for adoption. But they're not. By gutting the community outreach elements of the Safe and Sound Pounds program - by turning it into simply a networking and schmoozing opportunity - PetRescue is not only betraying rescue groups, but the pets these pounds will kill. A lack of "working together" doesn't kill pets. Pounds who fail to implement the very first basic step of lifesaving - actually allowing pets an option other than death by offering adoptions - kill pets. Yet they are still being spoon-fed and humoured by PetRescue and the Safe and Sound Pounds program as just not having the right “tools” yet. The only obstacle pounds are facing are themselves. These pounds are lazy. Often they’ve found community groups who are willing to step in and do their work for them at no cost (“working together”) and the only obstacle to this changing, is the pound’s own inertia. Unfortunately, the cooption of the ‘Safe & Sound Pounds’ program to turn it into a can’t-we-all-get-along, G2Z-style pound PR program, is a massive hit to all of us who reject councils being given sanctuary by the groups who should be holding them to account. Rescue groups cannot do the heavy-lifting required to save all the pets at risk of death in the pound. It’s not physically, emotionally or financially possible. We need safe pounds. We need them now. We can't wait another ten years before we choose a real solution to pound killing. And we’ll only get there when strong voices come together and demand that killing be taken off the table in every single facility nationwide. We must demand pounds be safe places for pets. All the programs and services that we take for granted in animal welfare were once controversial - they were ridiculed and rallied against by the killing organisations. A They weren’t implemented without a fight. And it took the direct fight of challenging the practices and beliefs of the local pounds and large national organisations. Our success has been from the bottom up - it has not been paved by the large national groups. Link - Nathan Winograd - Do we need to fight for No Kill?